Multiple Project Awards for Hubert Construction | Hubert Construction, LLC. Hubert Construction of Gaithersburg, Maryland has been awarded four new projects, with a total contract of more than $5.25 million. Work will commence on these projects over the next thirty to forty-five days. The largest project a 15,ooo sf childcare facility located in South Riding. It will be the first Washington area Kid’s R Kid’s franchise. Hubert has worked with the client, the franchisee, over the last 18 months to bring this project to life, working tirelessly to bring this project in line with the stringent budget requirements driven by the owners ability to obtain financing. The finished building will deliver in time for the start of the 2015/2016 school year. A smaller project, but for a very important long term, repeat client, is the expansion of the Sport & Health at Brambleton. This project will add 4,500 sf to the existing 38,000 sf facility originally built by Hubert in 2009/2010. The space will be an expansion of the Kidz Klub along with the new Explosive Performance Training Center. The expansion space will be open to members in February. The final two projects are for repeat residential clients Ryland Homes and Toll Brothers. 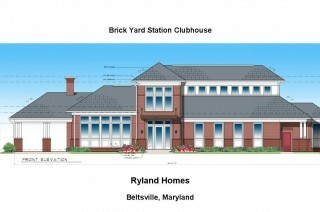 Ryland has contracted with Hubert to build the clubhouse at The Brick Yard Station a mixed use community located in Beltsville, Maryland. The 3,783 sf building designed by Devereaux and Associates will include an outdoor pool, construction is expected to be completed for a summer 2015 opening. Arundel Forest will be the location for Hubert’s second project for Toll Brothers Maryland team. The 3,500 sf wood framed building will have a brick and stone facade, with a highly appointed interior, along with an outdoor pool. Both projects are expected to commence in December and will be the 9th and 10th clubhouse delivered or under construction in 2014 by Hubert. Hubert Construction is an award winning commercial general contractor, design builder and construction manager. Please contact Matt Shea at 301.721.4393 or via email m.shea@hubertco.com for assistance.